Brainiac's exobytes continue to cut into the JLA Watchtower in space and find Aquaman still recovering from the attack last issue. Superman arrives just in time and uses his heat vision to take them all out. Aquaman insists he can fight, but Superman orders him into a water tank to finish recovering. Superman contacts the other League members and warns that these exobytes can actually steal their powers, but the comm goes down. With a quick X-ray, Superman sees that Brainiac is taking out the power grid and that life support is going to shut down. In another part of the Watchtower, Brainiac's exobytes chase after Batman, but he outsmarts them and reaches the weapons room in time to take them out. He manages to reroute enough power to buy time for the rest of the league to escape. While Luthor, Black Canary and Atom continue their assault on Brainiac's mothership, Luthor offers a backhanded apology for causing Atom's arm to be blown off by the explosion last issue. They find the chamber with Brainiac's bottled cities. Using Atom's shrinking power, they enter a city from Korugar and Luthor steals yellow Sinestro Corps rings from dead Corps members. Hawkman narrowly escapes the attacking exobytes and is rescued by Flash. The air runs out, but Firestorm rounds the corner just in time and expands his created air pocket to save their lives. Then Zatanna magically explodes more exobytes to save Superman and Plastic Man. Batman orders the League to the teleporters and hopes that everyone is accounted for before the whole Watchtower explodes. Unfortunately Aquaman is still recovering in his water tank as the room around him begins to burn up. Story - 3: Soooo little story was advanced in this issue. Sure, it seems like it's leading up to a big end point, but I wanted to see more than just action and retreading on ideas that have already been talked about. On the other hand, the overarching story remains compelling, especially since there is still clear jeopardy in both plots. With a few exceptions, anyone could die in time. On the final page when Aquaman appears to be about to die, it's a completely relevant cliffhanger. He might make it, but there's a very good chance that he won't. And in the future, I'm looking forward to seeing what Luthor will do with the Sinestro Corps rings. Art - 3: Some of the issues have used the method of switching artists for the present and future stories, but this issue only changed inkers. It helped lead to a more consistent experience while still clearly differentiating in style. The inker of the future story is still better than one handling the present. It's a style choice, but I stand by it. 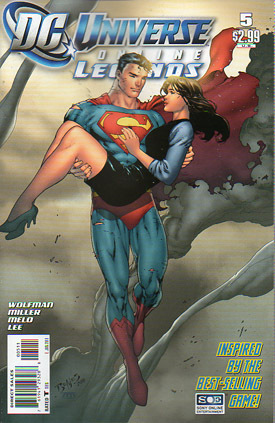 Cover Art - 4: It may be a cliché, but I love this cover for its Superman and Lois. Even though Superman's face isn't what I would normally expect, it's a great shot. His body is scratched and scarred, the costume is ripped and he has clearly just come out of a battle to rejoin with Lois, who looks immaculate. It's not dynamic enough to warrant the coveted "5 out of 5" mark, but still well done. And sadly, this is not a scene that occurs in the issue at all, but that seems to be the M.O. of this series at this point anyway. 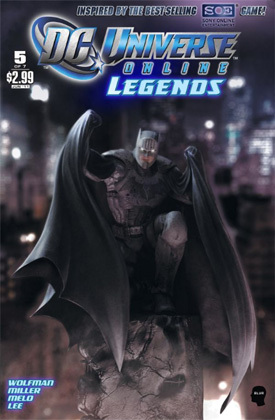 Digital Cover Art - 5: I love how Future-Batman looks. The backgrounds are great and it's clear he's in Gotham. I can imagine a story that explains why his outfit changed over the years, but I don't need those blanks to be filled in by the storytellers. At least not yet.